The Center Piece of Beijing's largest park on a Map. A Satellite Image and Map of the South Half of the Park Including the South Gate, the Round or Circular City, Marble Bridge and Yong An Temple with the Famed Bai Ta Si, remnant to the 17Th Century visit of the 5TH Dalai Lama visible atop on Jade Island. Welcome to the Beijing XiCheng District Maps Menu at China Report.com / www.Drben.net. The Below Menu Page gives Quick and Easy Direct Access to Maps of Xicheng District and Landmarks used in THE BEIJING REPORT, a part of ChinaReport.com. Both the Palace Museum of Beijing and the Largest Square in the World, TiananMen Square are officially Part of the DongCheng District of Beijing. They are therefor included in this List of Maps of Dongcheng District, Beijing. 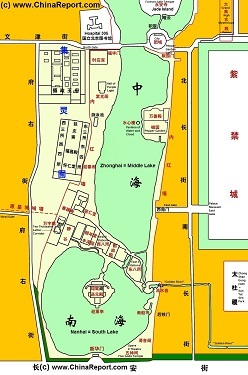 Beijing's largest park, the North Lake Park or Beihai GongYuan, immeditaly North-West of the Palace Museum in Beijing's Dongcheng District on a Map. 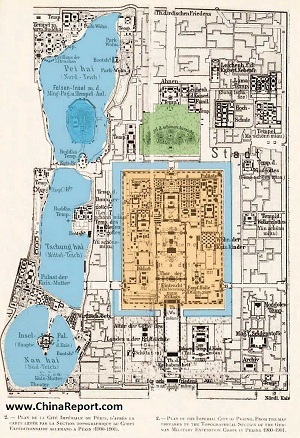 The Schematic Map clearly gives the location and shape of each major structure within the Park, such as Jade Island - the green centerpiece with the Bai Tai White Dagoba on Top, the Round City - a remnant of the Kublai Khans Palace in Khanbalik (Beijing), the North Shore with the Five Dragon Pavilions and various exquisite Tempels, The West Shore and East Shore and all access gates into the Park. Find your way through the Park using the explanations with this Map, and connecting Links to Photos and background texts on each seperate section of the Park. Text and Virtual Park still under Editing, Map already available. National Theatre Construction Site Satellite Image and Map, An overview from Space at National Theatre under construction in summer 2002. National Theatre, located West behind Great Hall of the Peoples at Chang An Avenue, is also known as the Silver Dome, and will be opened in Summer 2005. ZhongNanHai - Zhong Hai and Nan Hai (Lakes) Satellite Image and Map, A unique view into China's Secluded Leadership compound "ZhongNanHai" - with Zhong Hai and Nan Hai Lake, part of the ancient watersource of the Imperial Capital of Beijing within - From Space. 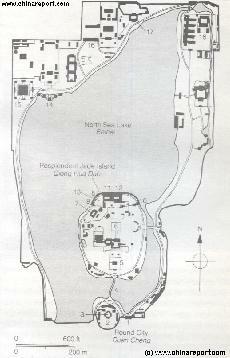 ( Appreciate the Unique Imperial Gardens design and Lay-out, compare with Beihai and other Northern lakes. ) This Area is not accesible to the General Public. Special Details & names marked on the Map where available. 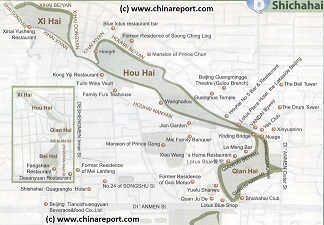 Map of the popular ShichaHai (3 Lakes) area of Beijing Old City. Shichahai - 3 Lakes Region Map, A handy map of the now renowned shichahai lake, culture and bar area shaping the border between the Dongcheng District and Xicheng District of Beijing. Browse the Map to find each bar, cultural venue and ofcourse historical landmarks, monuments and hotspots of this scenic area of the old city of Beijing. Important features of the 3 lakes region include Qian Hai Lake, Houhai Lake and Xi Hai Lake with Opera Star Mei Lanfang's former residence, prince Gong's Palace, Soong Ching-Ling's former Villa, a home of the disgraced Last Emperor Pu Yi and much more. Browse the Map to view the realm of the highest Communist Party Leadership in China, as it was arranged in the 1960's and 70's when Mao Zedong was the master of the Nation. Various details such as Gates, Guard Houses, Hospital and Clinic, Mao's swimming pools, Zhou Enlai's official residence and more. Imperial City in 1900 AD -Including Zhong Hai and Nan Hai (Lakes) Complex, Beihai and Jingshan (Coal Hill). ZhongNanHai - Zhong Hai and Nan Hai (Lakes) Schematic Map 03. 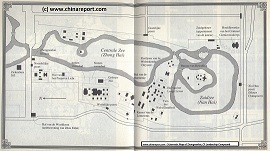 Dated 1970 / 80's Era Schematic Map of China's Secluded Leadership compound "ZhongNanHai" - depicting major structures within the Zhong Hai and Nan Hai Lake Complex. Additional names of structures added.